"Inside the Industry" - Blog @ That Awesome Shirt! Check out all the new apparel colors we have added to the site! TeePublic has added a few more colours to their selection. If you said no to a print before because of hideous colour combinations, then you should take another look in case it works better with one of the newer colours. 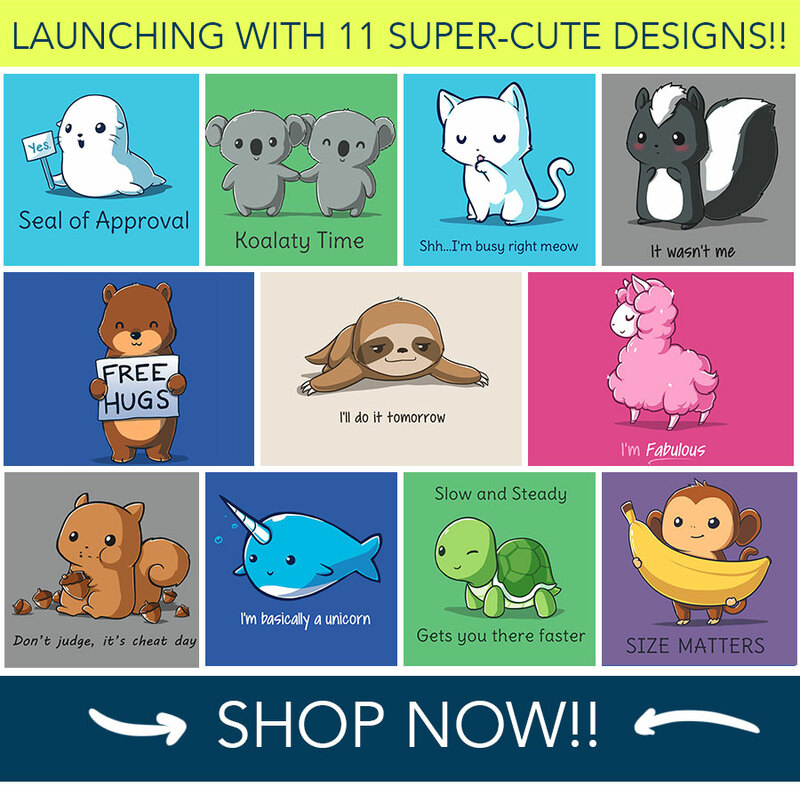 TeeTurtle's sister site LookCuter.com is launching with 11 NEW designs with a 50% off kick-off sale! TeeFury CEO has written an open apology about the recent re-launch of the website's ecommerce system and promises to improve the overall customer experience when using the refurbished website. I wanted to personally send this email to all of you about the current state of TeeFury. Before I get into it I’d like to say thank you for being our customers and going through this growth with us. At the office we often talk about how amazingly passionate, loyal, and sincere all of you are and it is a serious pleasure to have you as our customers. That being said, I wanted to talk about two important things: what’s happened at Teefury and what’s going to happen. I’ll address the former first. As most of you have seen and experienced Teefury has transitioned to a completely new website. This wasn’t just a re-skin of the website but an entire shift in platform and how we operate as an ecommerce company. Our new website is allowing us to do new things that we are so excited to share with you (more on that later), and it’s also caused a number of problems for our customers. For that, I want to personally apologize and say that you expected more from us but we didn’t deliver. Every time a customer reports an error or tells us how to improve we take that extremely seriously and appreciate the feedback. Recently a lot of our customers have been experiencing confusing issues with order status and wondering where their orders are. We know where these issues have stemmed from and have been working to fix all of them. Our customer service team has been working diligently to solve all of your issues and handle each customer complaint personally without offering canned answers. I can promise you that these issues are not going to be issues much longer and within the next few days be completely resolved. We are going to relaunch our checkout process, many of you have had issues on older phones and web browsers and we will have a new checkout process rolled out next week that will fix all of those problems. We also implemented a new printing process that did not work as we had planned and this is what caused delays in shipping the first two weeks in August, but we are caught up now and you should see our products shipped in the 4 days you’ve all grown accustomed to (not including time in transit of course). We also implemented a new email/ticketing system that has not worked as well as we had liked. In the next two weeks we will roll out a new ticketing system which we have improved greatly. We are behind on tickets but I assure all of you that you will get a response and we will address any comments, questions or concerns that you might have. Now onto the more exciting stuff: what’s happening in the TeeFury future. On the homepage we can now offer collections; some of these are curated from the gallery and the tee shirts we are offering are ready to ship right away. Others are new tee collections that are up for 1-2 weeks and we will print at the end when the collection comes down. This has created some confusion in and of itself. We will do a better job of communicating when you can expect a collection to ship. We’re currently growing and expanding in ways that we are sure will make you guys just as excited as we are. We hope to offer more shirt types e.g. women’s v-necks, scoop necks and tank tops on more colors and expand our product offering in general. This is why we chose to re-platform our website. Our loyal customers wanted more, and we want to give it to you. Keep your eyes peeled, we have a ton of exciting things coming. All of this said, thanks again for being loyal and fair with us. It means a lot that you have all stuck with us through thick and thin and continue to do so. This email was long but thanks for reading all of it. Our customers are the best in the world and we are so glad we get to share our company with you. Hello Everyone! DEEZTEEZ is under new ownership. The new owner is incredibly excited to speed up delivery times and provide you with the best customer service you will ever experience. ANTICLOTHES tees formerly featured on DEEZTEEZ have been spun off on to a new website. ANTICLOTHES is now SEPERATE from DEEZTEEZ. These tees will be sent in their own email, if you do not wish to be updated on ANTICLOTHES you can unsubscribe at the bottom of this email. To celebrate the occasion, all shirts on ANTICLOTHES are $10! Check out the a few selected designs ANTICLOTHES or see anticlothes.com. J!nx: Say No To SOPA! Glad to see that a shirt store has taken the stand against his hideous crime against the Internet. It's a simple message; "Protect Internet Freedom! Say NO to SOPA!" The content industry is trying to fast track two bills through congress that threaten the very foundation on which the internet was built. We are taking a stand against SOPA, and we want you to join the cause! Fight for your freedoms, and help stop censorship! Not sure what SOPA is about? Find out more here. Grab it from www.jinx.com for $21.99. Ever wondered how shirt designs are created? John Glenn from Glennz Tees recorded a few illustration videos to show you how it's done. Click on the picture to see the corresponding video. You can find more on his blog.